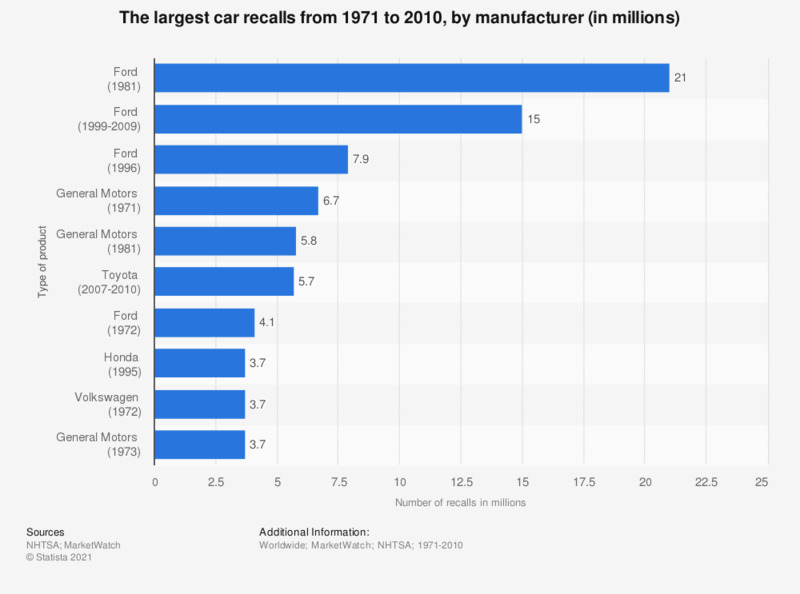 The statistic depicts the number of car recalls from 1971 to 2010, by manufacturer. Between 2007 and 2010, Toyota recalled some 5.7 million cars after some crashes were shown to have been caused by floor mat incursion. Large recent recalls in the United States include the Hyundai Sonata recall in 2012, where nearly 225,000 vehicles were recalled, as well as the 2013 Chrysler Group recall in the United States, where at least 490,000 U.S. customers were affected. * The source does not specify where cars were recalled. Based on data compiled by the National Highway and Transportation Safety Administration.